While speaking of the Lower Palæozoic Strata and the beautiful system of Life which they contain — a system of the highest importance in the inquiry now on hand — I find it convenient to employ the combination of Siluro-Cambrian, or Cambro-Silurian, as the occasion suggests; and have pleasure in thus commemorating in my phrase the gigantic labours, sometimes independent, sometimes associated, but always successful, by which, first of all men, Murchison and Sedgwick laid open for us these deeply-buried monuments of the earliest Life on the Earth. What Phillips tactfully avoided stating was that he, like all other British geologists, had to tread carefully since these "first of all men" now hated each other. But he was right in praising their achievements. Though some fossils have been found, the Earth lacks a rich fossil record for the first 80 to 90 percent of its history. The really good fossils start to show up in a geologic time period known as the Cambrian, and Adam Sedgwick originally named this period. Twentieth-century research has uncovered so many excellent fossils in Cambrian sediments, especially the Burgess Shale in Canada, that this geologic period is sometimes referred to as the "Cambrian Explosion." It's to Sedgwick's credit that he recognized and named the Cambrian almost a century before paleontologists found the best fossils. His identification was largely based on rock structures as he identified the Cambrian System based on rock layers in North Wales. The strata he studied weren't rich in fossils. Sedgwick was born in 1785 in Dent, the son of a poor vicar. As a young man, he wound up at Trinity College, Cambridge, and stayed there for the rest of his life. He was initially admitted as a sizar, meaning he was a student who needed financial assistance. Despite his limited means, he eventually managed to visit continental Europe, in 1816. He disliked the French and loathed the Catholics — an ironic position considering he took the same vow of celibacy that a priest would. Celibacy was expected of Cambridge Trinity Fellows, and his commitment to it meant that he could take over as Woodwardian Professor of Geology in 1818 when the holder of the post decided to marry. For decades, Sedgwick had clerical duties about 60 miles north of Cambridge, and at Cambridge, he headed the vice squad. In what one hopes was his busiest month, he arresting no less than 15 women for prostitution. One might get the impression he didn't much like ladies, but in fact, he rather resented his celibate lifestyle all his adult life. So, apparently, did some of the ladies. Before accepting the Woodwardian Professorship, Sedgwick hadn't been all that interested in geology, but he became convinced outdoor exercise would benefit his fragile health. He quickly went to work collecting specimens for the Woodwardian Museum. In 1904, when Cambridge replaced the diminutive Woodwardian Museum with a larger one, it was named for Sedgwick, and the Sedgwick Museum remains open to the public today. 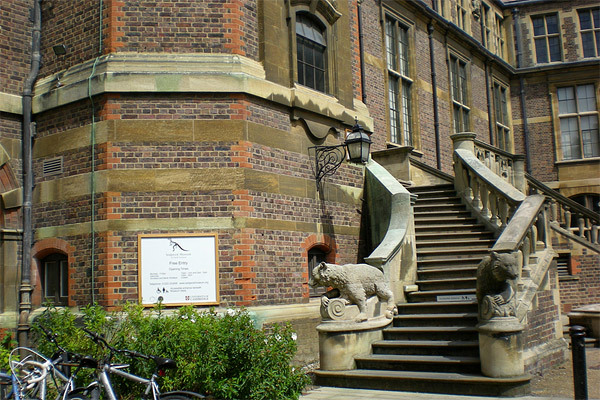 Main entrance to the Sedgwick Museum at the University of Cambridge (top). 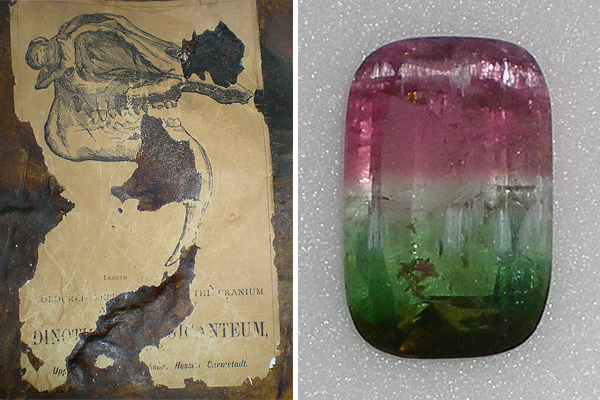 Vintage label (bottom left) and watermelon tourmaline (bottom right) on display at the museum. Photos by Michon Scott. For much of his life, Sedgwick was regarded as a plain-spoken, respected gentlemanly geologist who could hold an audience spellbound. (Charles Darwin found geology boring until he attended Sedgwick's lectures.) Yet geologists had to tiptoe around Sedgwick's priority dispute for years. In 1835, he helped a fellow geologist, Roderick Impey Murchison, identify the geologic time period known as the Devonian. Murchison and Sedgwick were good friends, but their priority dispute broke their friendship. While Sedgwick claimed certain rock strata for the Cambrian, Murchison claimed the same rocks for a period he named, the Silurian. When Murchison was president of the Geological Society of London, the society passed a resolution banning Sedgwick from presenting any paper about early Paleozoic life. The Cambrian-Silurian rift lasted nearly 20 years, ending only when Sedgwick sent a note of condolence on the death of Murchison's wife.In 1879, geologist Charles Lapworth settled the dispute by assigning the older rocks to the Cambrian, the newer rocks to the Silurian, and carving out a new period in between: the Ordovician. By then, however, both Sedgwick and Murchison were dead. The dispute over rock layers naturally included the fossils used to identify them. Angelina sedgwickii is a trilobite (an extinct marine crustacean) named for Sedgwick — and ironically first described in a book authored by Murchison. Sedgwick was sure the fossil was Cambrian, and Murchison was likely just as sure it was Silurian. It has since been assigned to the lower Ordovician. Rejecting a literal reading of Genesis in terms of time, Sedgwick took on the scriptural geologists — the creationists of their day — especially William Cockburn. In his 1849 book entitled A New System of Geology: Dedicated to Professor Sedgwick , Cockburn argued that his own interpretation of Earth history fit nicely with knowledge handed down from Moses. Sedgwick responded. Then Cockburn responded. The argument became national news. I cannot but think the work is from a woman's pen. . . . [It] leaps to a conclusion, as if the toilsome way up the hill of Truth were to be passed over with the light skip of an opera-dancer. This mistake was woman's from the first. She longed for the fruit of the tree of knowledge, and she must pluck it, right or wrong. He really could have used a wife. I have read your book with more pain than pleasure. Parts I laughed at till my sides were sore; others I read with absolute sorrow, because I think them utterly false and grievously mischievous. Going after Darwin, however, Sedgwick had fewer supporters. Despite his anger over Darwin's support of evolution, the two remained friendly, and even in his eighties, Sedgwick could wear out the younger man with a tour of museum collections.